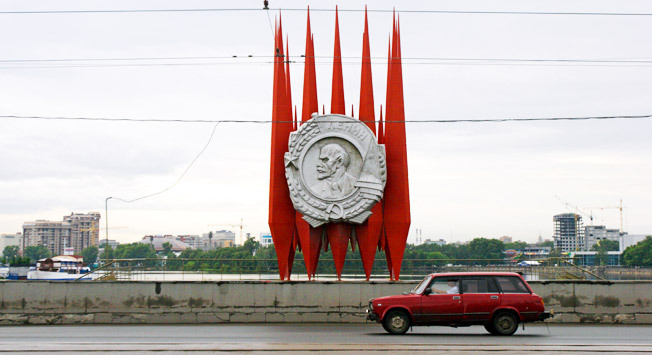 Old Yekaterinburg is a puzzle of a city – one that doesn’t reveal its secrets to just anyone. In this publication, we highlight 6 unusual places in this metropolis, which are rarely shown to tourists and which can only be found in Russia. Inside Yekaterinburg’s limits, there is an old sacrificial place, a metallurgical base, and a nominal center of Neolithic prehistoric settlements, all of which can be found at the Shartashskaya Stone Tents site, comprised of huge granite boulders and unusually shaped skerries, resembling giant beaks. Here you can vividly imagine how ancient pagan cults practiced their rites by exploring the entrance to the sanctuary, the stone bowl where victims were sacrificed, and a granite amphitheater. As a side note, the blood-thirsty revolutionary, Yakov Sverdlov, who led the Bolshevik organizations in the Urals, held a banned secret meeting of Bolsheviks here in 1905. It is worth mentioning that the Stone Tents are surrounded by the picturesque Shartashskaya Park – a beautiful wilderness, which is situated directly behind the town. This wooded park area of 777 hectares is in itself an archaeological, historical, and geological natural monument, spread out under the open sky, and the park is also considered to have cult relevance for the townspeople. Residents of Yekaterinburg feed the squirrels, ducks and seagulls (which are not afraid of people), go on picnics, go fishing, ride bikes, jog, and in the winter snowboarding and skiing on the numerous mountains. The heart of the park is Lake Shartash, along whose banks were located up to 10 different ancient human settlements and sites from the third millennium BC. Now, these settlements are joined by beaches, boat docks, recreation centers, cafes, and walking paths. Shirokorechenskoe Cemetery, located on the southwestern outskirts of Yekaterinburg, is often found on lists of the most bizarre graveyards in the world. It is the earliest necropolis, meant to serve as a kind of memorial park, where heroes, persona non grata, and many famous people are buried, including folk artists, scientists, and generals. There is a huge number of unusual funerary sculptures, acclaimed names etched into stone, and the strange conical church of St. Mark of the Caves near the main entrance, which is the apotheosis of the eclectic architectural styles that impart the feeling that somewhere here a portal to another world is about to open. Here you can find reliefs, a 7 -meter high stele, an eternal flame, gems interspersed in headstones, and laser engravings of the deceased to their full height. Shirokorechenskoe Cemetery features an alley of crime bosses killed in the wild ‘90s in the war between the “Uralmashevsky” and “Tsentrovy” gangs. At that time, Yekaterinburg was one of the crime capitals of Russia. One can also see young thugs with gold chains, tattoos, cigarettes, and keys to Mercedes engraved on expensive black marble monuments, towering 2-3 meters high. The plates display not only the names but also nicknames and talents of mafia leaders killed in shootings (for example, one reads “an expert in knife-throwing”; another – “possessed deadly fist-fighting skills”). This “mafia alley” is located in the Northern churchyard of Yekaterinburg. Today, they are a kind of open-air museum – a reminder of the turbulent ‘90s. The same cemetery is home to a Military Memorial to veterans of Word World II, where, every year on May 9, the city and regions’ leaders lay flowers. It is here where most of the soldiers who died of wounds in Sverdlovsk hospitals were buried. The Shirokorechenskoe necropolis was founded in 1940 and occupies 44 hectares. Now the cemetery is open only to kindred of the buried and citizens who have been bestowed special honors. No less interesting is one of the oldest cemeteries in Yekaterinburg, the Ivanovo Cemetery, still preserved to this day. It originated in 1843 and is located in the central part of the metropolis. It is home to the John the Baptist Church – the only church that did not close even during Soviet times, and today has been granted “Cathedral” status. It was built in 1846 on the initiative of Yekaterinburg merchant Yefim Telegina, the founder of a family business in the Urals. So many interesting and ancient graves have survived at Ivanovo cemetery. One can visit the grave of the last abbess of the Novo-Tikhvin Nunnery Magdalene who died in 1934 or the discoverer of placer gold, Lev Brusnitsin, whose discovery propelled the Russian Empire into the leadership in world gold production. In the middle of the cemetery, the most ambitious sculpture stands on a hill. Here lies buried the famous Russian writer, author of “Tales of the Urals”, Pavel Bazhov. In contrast, just a few steps away, a strange monument stands, bathed in blood-colored paint – the tomb of one of the murderers of the royal Romanov family, Peter Ermakov. Seeing tanks in Russia is not going to surprise anyone. Armored vehicles can be found at military schools, in parks and museums, on school grounds, and even in the yards of ordinary residential buildings in a residential area! A perfect example is the yard at 18 Vysotsky St. Instead of a playground, two real battle tanks from the Soviet era stand. Kids frolic around the heavy machinery. More than one generation has grown up playing on and around the tanks. Old-timers say that the tanks were installed in the 80s; but from where and under what circumstances, no one can remember. If you look closely, you can see that the tanks are installed on a pedestal and, accordingly, are a monument of military glory. They presumably were intended as a memorial to Word War II. Several years ago, an organization tried to remove the tanks from the residential yard, but the locals fiercely defended them by surrounding them with their own vehicles to block access and by staging rallies that attracted media attention. As a result, they succeeded in defending their local landmark. Old Man Bukashkin, or properly known as Evgeny Malakhin, is a local Yekaterinburg legend. Bukashkin was a famous urban artist, amicably referred to as the “People’s Janitor of Russia” and “The Russian People’s Old-Man”. He was a punk clown and founder of the Kartinnik art movement, without which the art life of Ekaterinburg would be impossible to imagine. Bukashkin was educated as an electrical engineer who operated surveillance at power plants, but he became famous as an artist. The old man’s counter-culture art canvas became the entire city, including gray garages, dumpsters, and dull concrete fences. Bukashkin even developed his own “theory of garbage”, according to which any debris can be viewed as a work of art. Bukashkin’s work has been sold worldwide and is stored in the Rare Book Department of the British Library in London and in the museums of Moscow, Yekaterinburg, and Nizhny Novgorod. The Bukashkin Trail - is a walk-through enclosure (at 5-b Lenin St.), a kind of street route to an exhibition of paintings on the walls, fences, and garages, which also features poems scribbled by the artist. The Bukashkin museum is a little further, located in the building of the Faculty of Arts and Culture at Ural University (51 Lenin St.). The most unusual route in Yekaterinburg can certainly be considered the single-track tramline to Zeleny Ostrov. It is worth noting that the 4-kilometer route has not changed since 1935! Therefore, the tram should be viewed not simply as a means of transportation but also as a time machine, where one can plunge into the atmosphere of entirely different eras. Just as it was many years ago, a token system still operates traffic control. The tram goes through the city streets and along the scenic coastal Verkh-Isetsky pond. In the summer, the track crosses a brood of wild ducks now and then. Two cars, working with twenty minute intervals, cross one another many times daily at the junction. Archival photos show that this route is also the first in the area. So, if you are tired of the bustle of the big city and want to see the outskirts of historic Ekaterinburg, take the old rattling tram, No.11. The most beautiful and unusual object in the immediate vicinity of Yekaterinburg, unparalleled in the Urals, is the Staraya Linza talc quarry at the Shabry settlement. For fans of the urban trip, this is a fantastically beautiful, abandoned site, which is one of the ways to get in touch with a period frozen in time, where one can travel back in time and be enveloped in the atmosphere of films based on works by the Strugatsky Brothers. At the bottom of the quarry old machines and equipment remain, including: narrow-gauge rails, trolleys, lift mechanisms, huge saws, all of which enhances the effect of an alien world. The width of this unique open-air museum is 400 meters, and its depth is 100 meters. In the summer, waterfalls stream down the sides of the wells. Here you can find beautiful talc, serpentine, smoky quartz, and tourmaline crystals. Development of the quarry began in 1931 when the Soviet Union's largest talc combine originated in Shabry, which is still operating to this day. The Shabry talc-magnesite field is one of the largest in Russia. The quarry was mothballed in 1974. In order to get there, one must drive from Yekaterinburg along Polevsky highway 17 miles to the sign for Shabry; turn left to reach Shabry, where the complex is located; the quarry can be reached by foot, one kilometer from the complex. 1. Be ready for a bizarre maze of streets. Narodnaya Volya St. appears out of nowhere and then disappears into nowhere as many as four times. The miraculous Krestinsky St. itself is at times parallel and perpendicular, and crosses Schwartz St. twice. Chutskaev St. runs parallel and perpendicular to itself five times and crosses itself four times! 2. Do not drink unboiled tap water! It is harmful to your health. 3. Ticks are the most active during the warm months, and they can even find you within the precincts of Yekaterinburg. If you find one of these bloodsuckers, do not try to remove it yourself – see a doctor. 4. Do not cross the road in the wrong place. Yekaterinburg car inspectors are very worried about the safety of citizens and can appear even in the back alleys where you would least expect to see them. To avoid a fine of 500 rubles and tedious procedures for the filing of papers, do not break the rules. 5. Never let your guard down! Yekaterinburg is a big city, with all the typical risks that this entails. Email: yekaterinburg4u@gmail.com, Tel: +7 912-280-08-70.